An impressive technical achievement, with excellent 4K performance, but altogether too expensive as a realistic graphics card purchase. The R9 295X2 is likely the final throw of the dice for AMD's current spin of Graphics Core Next (GCN) architecture. It takes a pair of the fastest Radeon graphics chips available and squeezes them into one behemoth of a graphics card. That's a familiar refrain, with both AMD and Nvidia traditionally filling out their top-end lineups with dual-GPU cards based on their finest single-GPUs. This time around AMD have done things slightly differently. Normally these dual-GPU cards operate with the top graphics chips, but in order to have them running effectively on a single PCB, their engineers will clock down those processors. With AMD's previous dual-GPU card, the Radeon HD 7990, they'd clocked their Tahiti XT chips at 950MHz compared with the 1GHz clockspeed of the chips at the heart of their top HD 7970 GHz cards. Likewise with Nvidia's GTX 690's the GPUs were clocked at just 915MHz where the comparative GTX 680 was running at a hefty 1,006MHz. This is one of the reasons I'm left rather cold by Nvidia's announcement of their $3,000 GTX Titan Z. At some $1,000 more expensive than a pair of the GTX Titan Black cards that it's based on, it's also likely to run slower than that SLI pairing. The Titan Black's GK110 GPU runs at 889MHz and the Titan Z is likely to be closer to 800MHz, if it follows tradition. The R9 295X2 doesn't follow that tradition. Thanks to the Asetek-designed liquid chip-chiller they can actually run the R9 295X2's twin Hawaii XT chips faster than the Hawaii XT GPUs in the Radeon R9 290X. This is the first time a reference-designed board has turned up either with water-cooling as standard or with the dual-GPU configuration setup quicker than the single-GPU cards it's come from. On the sample I've been testing that only amounts to some 18MHz faster than the 1GHz GPUs in the R9 290X, but I would have still been impressed if they'd kept the exact same core clock. My reference R9 290X runs at 95ºC when it's going at games full pelt. Trying to cope with two of those chips, at that temperature, with one dual-slot air-cooler, would have been almost impossible. The water-cooling route then was vital, and the fact the R9 295X2 is limited to run up to 75ºC before throttling back is interesting too. In practice my R9 295X2 barely runs much above 65ºC in-game. And it performs some impressive gaming feats at those temps too, most impressively at 4K. That's what this dual-GPU monster was designed for - offering genuinely playable gaming performance at resolutions as high as 3840 x 2160. As well as being the fastest single graphics card available, it's also probably the simplest way to get a decent gaming setup running on a 4K screen. The simplest, but not the cheapest. Because of the all the extra engineering effort and expense that's gone into putting the R9 295X2 and it's water-cooled, Titan-aping shroud together, it's retailing for £1,100 / $1,500. In the UK that's some £250-odd more expensive than buying a pair of R9 290X cards and linking them together in a CrossFire-capable motherboard. It's also more expensive than buying a pair of Nvidia GTX 780 Ti cards. 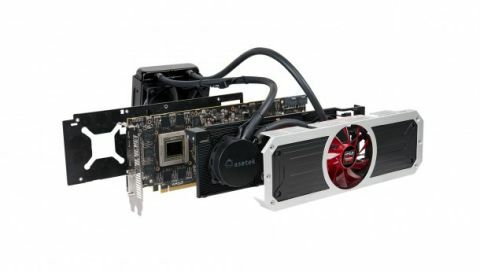 But thanks to the huge 8GB GDDR5 frame buffer the R9 295X2 is sporting—filling out those twin 512-bit memory buses—the Radeon card is a far better bet for seriously high-resolution gaming. Taking Battlefield 4 as an example, the AMD card is able to hit 60FPS at Ultra settings in 4K, while the SLI GTX 780 Ti is some 25% slower at 48FPS. It reads even worse for Nvidia in the GRID 2 benchmark, though the platform-agnostic Heaven 4.0 synthetic test still gives the win to Nvidia. But yes, we are still talking about a single graphics card that likely costs more than most of our full gaming PCs. It might make sense if you've already spent that much on a 4K-capable screen and need something to actually run games at that rarified resolution, but for the rest of us it's an extravagant liquid-luxury. That's always what these cards are like though. They're produced in such limited numbers that you're more likely to see it shining out of the side of a LAN event show machine than out of the perspex side of your buddies' rigs. These are tech showcase cards, proof-of-concept creations designed to demonstrate the extent at which different company's technology can be pushed. As an example of what AMD's GCN architecture is capable of when it's scaled up and water-cooled the R9 295X2 is thoroughly impressive. It's a great technical achievement to produce such a good-looking card with such low thermals and such slick performance. But as a card that I could actually recommend anyone buy? Not so much. The R9 295X2 only makes sense if you're looking for a seriously high-end, 4K-capable miniature gaming machine. That's the only place you need such efficient cooling and use of space. In a desktop rig, with a chassis capable of holding a pair of graphics cards, you can get the same level of performance from a pair of R9 290X cards. With third-party air-cooling solutions from the likes of Sapphire, you can get decent thermals and still hit the same 4K speeds. I'm happy to applaud its design and performance, but I couldn't recommend it as a sensible purchase; even if you can afford one or find one for sale. It's the performance of the R9 295X2 at 4K resolutions that really impresses, though the cheaper Nvidia SLI pair does have a few tricks up its sleeve when it comes to Heaven and the Unreal Engine 3's Bioshock Infinite. Power-wise you can also see where the Nvidia Kepler architecture is more efficient, with a pair of GTX 780 Ti cards drawing some 200W less juice at peak platform operation.